Rehabilitation following a brain injury can be unpredictable because every brain injury is unique. When brain cells are damaged they do not regenerate. However, the brain and nervous system have an ability to reorganise itself, learn and reshape. This is called Neuro-plasticity. For re-learning to take place movements need to be repeated and practiced just as you would expect learning to play an instrument or take part in a new sport. During recovery, other areas of the brain take over the activities of the damaged areas and new nerve pathways can be established using undamaged brain cells. Engaging in activity helps these alternative pathways to develop. 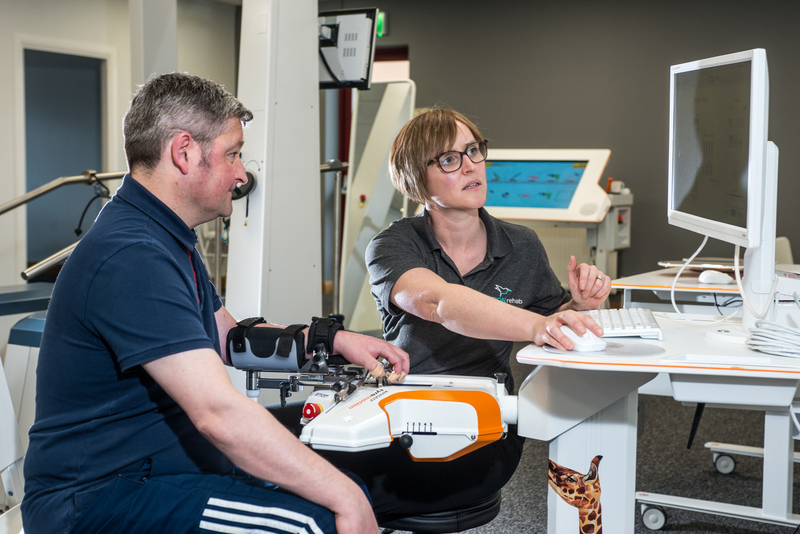 MOTIONrehab is the only facility in the UK to offer Intensive Neurological Rehabilitation Centre augmented by Robotics and Virtual Reality to facilitate high-intensity/high-doseage rehabilitation to help maximise recovery. 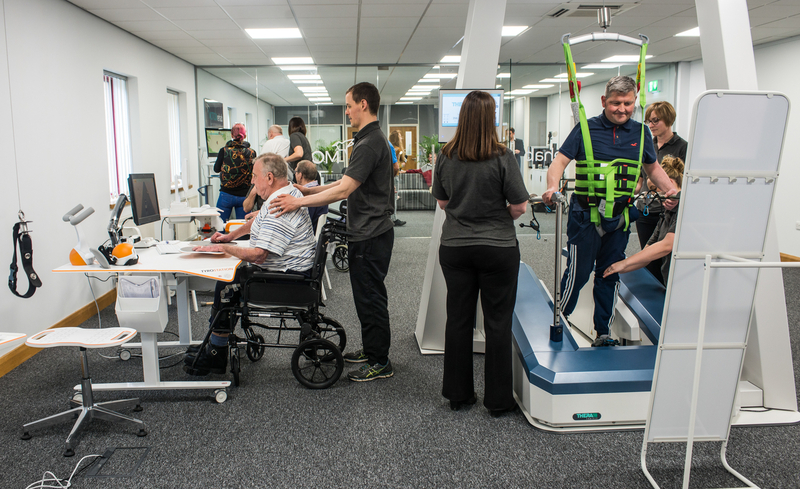 MOTIONrehab are renowned for their person-centred approach to rehabilitation, personalising each individuals therapy to enable everybody to achieve their individual goals and reach their full potential. MOTIONrehab accepts national and international referrals for both adults and children. Clients are able to self-refer or alternatively MOTIONrehab accepts referrals from Consultants, GP’s Private Insurance Companies, Personal Injury Claims, CHC, IFR. MOTIONrehab is happy to work in partnership with your GP, Consultant or other health professionals. Non-traumatic Brain Injuries to the brain that do not involve a traumatic or direct physical impact to the brain. This may include loss or complete lack of oxygen to the brain. Hypoxic Brain Injuries are brain injuries that form due to a restriction on the oxygen being supplied to the brain. The restricted flow of oxygen causes the gradual death and impairment of brain cells. The brain is protected and suspended in fluid inside the skull. Despite the hard bony case of the skull a trauma or physical impact to the head can result in damage to the brain. These are usually called Traumatic Brain Injuries, or TBI. Following a TBI, injury to the brain can be caused by a number of different factors. The direct impact to the brain can cause bruising and swelling which affects how the brain works. In more severe cases the impact can cause the brain to shake about inside the skull, resulting in tearing of fine nerve fibres and blood vessels found within the brain tissue. Lastly the brain can bang into the inside of the skull causing more bruising and bleeding. The severity of a TBI is usually measured by the length of time someone has lost consciousness for. Generally speaking the longer the time unconscious the more severe the brain injury. ABI can result in someone having difficulties with any of the function controlled by the brain. This is very unique and no two injuries are the same. It can include difficulties with speech, vision, thinking skills, personality and mood. ABI will also affect the physical functions controlled by the brain. These may include difficulties with movement, sensation, balance, strength, muscle spasticity and co-ordination. Rehabilitation is aimed at improving these difficulties so that someone can do as much for themselves as possible at home and whilst out and about.